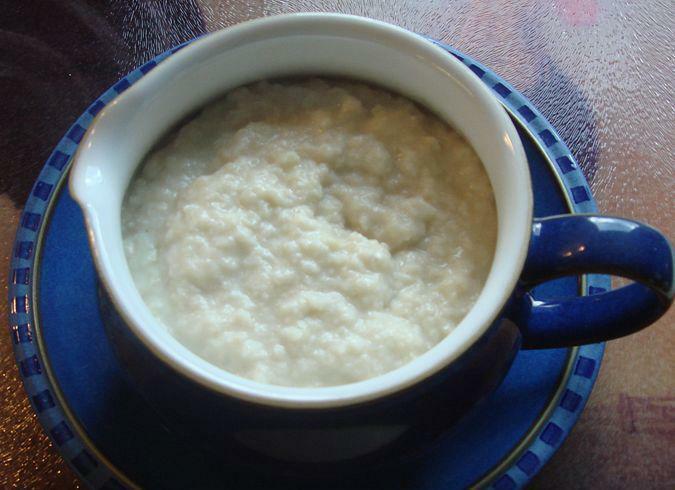 Bread sauce, a sauce made with milk, breadcrumbs and spices, is a staple at traditional Christmas dinners in England. The sides will include sausage links wrapped in bacon — quaintly known as "pigs in blankets," carrots or parsnips, and in many households, a thick sauce made of stale breadcrumbs and milk, infused with the flavors of onion, bay, mace and cloves. This is bread sauce. And as a British expat who has lived in the U.S. for nearly 20 years, it's the one Christmas dish I still can't live without. Not only does it transport me straight back to the Christmases of my childhood, its strange, sloppy texture and comforting spices have the magical ability to make everything on the Christmas dinner plate taste better. It perks up the Brussels sprouts, calms the bite of the cranberries and transforms every slice of turkey — however overcooked and dry — into a succulent, flavorsome mouthful. But outside of Christmas and certainly outside of the U.K., bread sauce is largely unknown. "The idea of bread sauce remains intensely baffling, possibly even disgusting, to any person who hasn't been brought up with British traditions," writes British cookery writer Nigella Lawson, who includes it in her collection of Christmas recipes. She, too, feels that it should be an indispensable part of Christmas. "I regard bread sauce as not only my legacy from my mother," she writes, "but as every Briton's sacred and stodgy inheritance." I learned my version of bread sauce from my mother. And it turns out that the sauce has been passed down through the generations for a good 500 years. It's actually a culinary relic of the Middle Ages, one of the few remaining examples of the bread-thickened sauces, stews and soups that were once served at Christmas feasts, and other celebration dinners, across medieval Europe. Spain's Romesco sauce — made with tomatoes, bread and ground almonds or hazelnuts — is another such culinary survivor. So is the famous Tuscan soup, Ribollito, which includes leftover bread, cannellini beans and Lacinato kale. Where today we would reach for a bag of flour to thicken a stew or make a sauce, a medieval cook would throw in yesterday's loaf instead. Soups and sauces played a big role in a medieval banquet, partly because they had to accompany the extravagant array of roasted and prepared meats that were the hallmark of a slap up feast. According to the prevailing medical wisdom, all that flesh had to be paired with carefully matched sides to ensure that the hot, cold, wet and dry "humors" of the finished dish were properly balanced for human consumption. The skills and ambition of a household's kitchen were also a measure of the host's status, so medieval cooks were engaged in a constant culinary arms race to find new ways to show off. Swans were the exclusive property of the Crown, but anyone with a deep enough purse could — and would — seek to impress their guests with a veritable menagerie. There would be venison, beef, lamb, pork, hare, rabbit, chicken, goose and game and song birds. The centerpiece was often a cooked and reconstructed boar's head, apple in mouth, eyes glittering as if alive. There might be a roasted peacock, its lustrous feathers painstakingly reattached and presented as if preening before the dazzled company. Roast chickens were made to leap up out of their serving dishes and live birds fly out of pies. Guests were presented with dishes such as the breadcrumb-thickened "Pygges' in a sage flavored 'Sawse" and hefty portions of venison or lamb with dollops of a spicy wheaten porridge made with milk. On the lighter side, there might be whole fish suspended in clear, savory gelatin and chicken or pheasant bathed in a spicy concoction of ground almonds and wine. The food would often be served on thick slices of bread or thin specially baked loaves, called "trenchers," but these edible plates were rarely eaten by the wealthy diners. The softening, savory bread would be given away to the poor or thrown to the dogs. Everyone got their own version of a medieval bread sauce! Several hundred years later, these bready sauces and dressings have more or less disappeared. One big reason is that fine wheat flour took the place of bread in recipes. In the middle of the 17th century, the French cook La Varenne described how to cook flour in lard to make a "roux" that could then be used to thicken soups and sauces. The switch to flour as a thickener became a cornerstone of a whole new way of preparing almost everything — from soups and sauces to entrees and desserts. Dishes became lighter and more refined compared to the stodgy medieval menu. And despite plenty of grumbling about fancy French food in 18th and 19th century England, the influence of what became known as "haute cuisine" gradually changed the way we thought about food. And come the 20th century, there were also major changes in bread itself. Industrial bread took off, and with it the rise to dominance of the soft, sliced loaf, wrapped in plastic. So how did the traditional Bread Sauce survive all these culinary transformations? Perhaps it's because it's a very simple dish. In the centuries since it sat on a banquet table, it would have been accessible to everyone, not just the wealthy. And like that other British oddity, Yorkshire Pudding, it's a filling side dish that makes the roast go further. And maybe there's something uniquely comforting about soggy bread. Is it just coincidence that bread and milk sprinkled with sugar has hung on as nursery food? Alas, my romantic speculations are interrupted by an email from the British food historian Annie Gray. She informs me that the popularity of bread sauce may be waning: "It's easier to just serve gravy with everything," she writes. She also blames "spuriously healthy fads around gluten free and low carb diets." She also notes that as people have become richer, something like bread sauce begins to look, well, a bit "down market." "You can't get more bottom end than onion, milk and breadcrumbs," she says. I realize she may be right. I raised my own daughter to appreciate the delights of Bread Sauce at Christmas. But while I'm going back to England to eat a Christmas dinner, complete with all the trimmings, my daughter and her American husband have a reservation at an Italian restaurant for Christmas Day. I can only hope there is a good medieval Ribollito on the menu!